Manitoba Ag Days is extremely excited to present the First Ever Manitoba Social taking place Wednesday January 23, 2019 at the Provincial Exhibition of Manitoba’s Dome Building. “We are always looking for opportunities to continue to grow and expand our show. With this years’ theme of Tell Your Story – Be An Agvocate we wanted to do something extra special to help positively impact our agriculture industry. We have worked with Agriculture in the Classroom -Manitoba (AITC-M) for many years as we recognize the incredible work they do for our industry. They play an essential role in helping educate our youth and future leaders about agriculture and agriculture practices throughout the province. We are very fortunate to collaborate with the Provincial Exhibition of Manitoba to utilize their newly refurbished “Dome” Building located on the grounds of the Keystone Centre. The building holds an incredible amount of agriculture history and the board felt it was a perfect opportunity to help showcase the space with a good old fashion Manitoba social.” stated General Manager, Kristen Phillips. The event will take place from 8pm until 2am on January 23rd, 2019. An auction is planned with all proceeds going directly to AITC-M. “It will be a great opportunity for exhibitors and patrons to come meet up, network and share our common passion for agriculture all while raising funds for AITC-M. We hope that funds raised will continue to help support and expand the AITC-M curriculum-based programming in schools throughout Manitoba.” stated Andrea Guthrie, Manitoba Ag Days Media Coordinator. The Manitoba Ag Days board challenges everyone involved in the agriculture industry to Get Involved #tellyourstory Be An #Agvocate Be #Agproud at #agdays19 and share some #farmfacts whenever the opportunity presents itself. 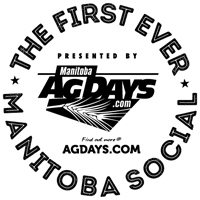 And while you’re at it join us at the FIRST EVER MANITOBA SOCIAL presented by: Manitoba Ag Days. For questions pertaining to the social please contact: social social@agdays.com and we will be in touch with you ASAP.